In the total absence of archives, we don’t know anything about the Park before the annexation of Normandy by the king of France, Philippe Augustus (1204). On the other hand, it is remarkable that we know, without interruption, the succession of the owners of the Park from the beginning of the 13th century until the present day. 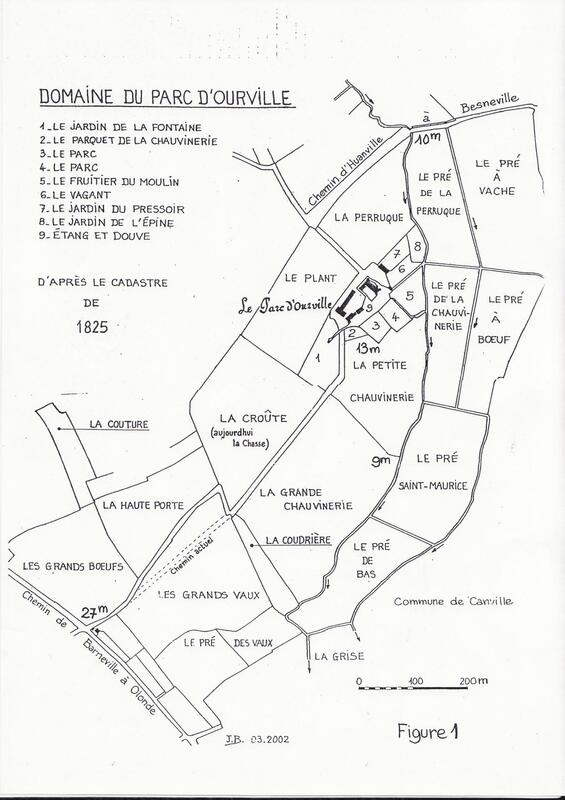 Due to lack of evidence we do not credit the assertions of Robert Asserlin, the learned historian of Port Bail, who, in the Port Bail parish bulletin, attributes the possession of the park before 1204 to the d’Aubigny family. This author does not cite his sources and we have not found anything permitting us to confirm his claim. The toponym “The Park” suggests the existence of a feudal park in the medieval era. The parks were vast expanses enclosed by thick hedges and moats or wooden stake fences. These enclosed spaces, ranging in area from 50 to 250 hectares, held by great feudal laity or ecclesiastics, with close to royal or ducal power, were dedicated to raising domestic livestock (horses, bovines, sheep, goats…) or game (stags, does, fallow deer, wild boar). This diversity in the animal population indicates the existence of wooded areas, prairies and floodplains. 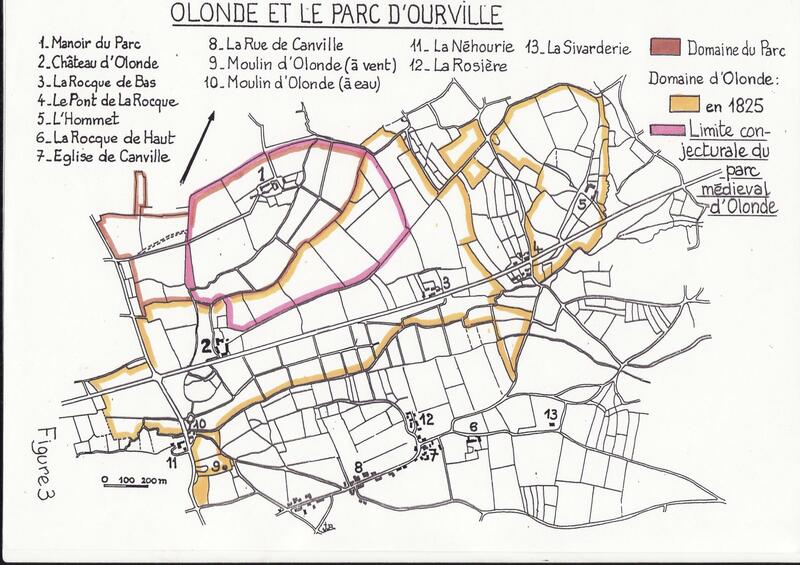 Aside from the toponymy, the position of the actual domain of the park in relation to that of Olonde suggests the following hypothesis: Originally, the actual domain of Ourville Park, for the most part, was the feudal park of Olonde castle. It would have then been detached in order to constitute the reserved domain of a new noble fiefdom created for a youngest child of the family. You will notice that Olonde was raised up in the 11th and 12th centuries to the Honneur du Plessis (3) and that the most ancient oath of loyalty to the king for the fief of the Park (1403) mentions that its owner owes the king the service, at Plessis castle, of one armed man for ten days (4). This may not be just a lucky coincidence. The conjectured limits of Olonde Park, of which the area could have covered roughly 63 hectares, are indicated in the drawing below, figure 3 (5). The Hazel Grove is in fact a double embankment with deep ditches. It acts as a “double barrier” made up of two raised or banks of parallel earth each one with a row of trees between which a passage is formed. 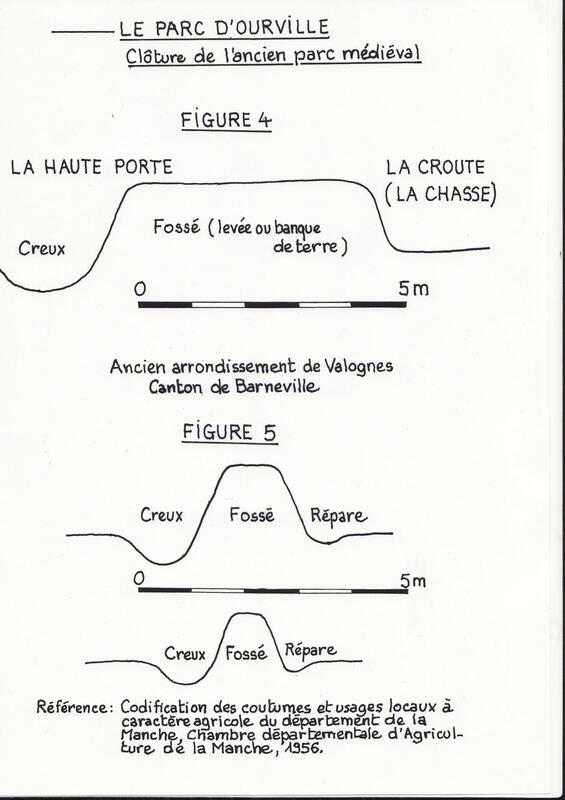 La Crôute (now called the hunting ground) and the Plant are bordered, within the limits of the ancient park, by an embankment the dimensions of which (height 2.4 meters, thickness at the base of 5 meters, and thickness at the top of 4 meters) are much more significant than those encountered traditionally in the area (see drawing 4 and 5). One finds oneself in the presence of a « double barrier » on a single bank of earth on which the thickness of the top assured a narrow passage between two rows of trees able to be used by pedestrians and, more exceptionally, by men on horseback. The tall trees have fallen and the groves have disappeared and now nothing remains but a meager thicket. The toponym “The High Door” identifies the entryway of the seigniorial Park. Another entry most probably existed close to Olonde castle. The toponyms: The Wood Grove, the Wood, the Field of the Woods, and the Little Woods found today in the domain of Olonde for an area of roughly 14 hectares are a “relic” of the wooded areas of the ancient seigniorial Park. The seigniorial Park of Olonde thus did not survive, as such, beyond the beginning of the 13th century. Léopold Delisle, Normand cartulary of Philippe-Augustus, n. 121. Mémoires de la société des Antiquaires de Normandie, volume XV, 1846, P.168. Thomas Stapleton, Magni rotuli Scaccarrii Normanniae sub regibus angliae, Londres, 1840, p. clxxvii et sq. Oath of loyalty of Collibeaux de Criquebeuf (November 23, 1403), National Archives, Paris, cote P/289/4. According to Marie Casset, the Parks are in elliptical form in order to enclose a large area of land with a minimum amount of fencing (M. Casset, un mode de gestion de l’espace rural : les parcs à gibier en Normandie au moyen-âge).